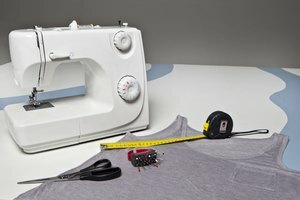 Baggy T-shirts may be chic, but if you prefer something a little more formfitting, you can alter a tee without even knowing how to sew. Grab your scissors—time to get creative. Put the shirt on and pinch the sides to determine how much tighter you want it to be. Mark this rough measurement on the front and back of the shirt with a marker. Measure from marking to marking and add 1 inch to that measurement. Do this on both sides and write it down. Cut the shirt up the sides along the hem, from the bottom hem up to where the sleeve ends. The shirt will be completely cut up both sides but held together by the neckline and top of the sleeves. Cut horizontal slits up the side of your shirt, approximately 2 to 3 inches apart and as deep as the measurements in Step 2. Do this on both sides. Lightly pull each strand created in Step 4 to slightly curl the edges. Do not pull too hard; this will stretch your fabric. Put your T-shirt on and tie up the sides. A friend can help by tying the right strands together or tying one side while you tie to other to ensure the shirt is even and fits nicely. To add a more feminine, boatneck look, cut the neckline off as close to the hem as possible. For a little flair, add beads to the strands before tying them.